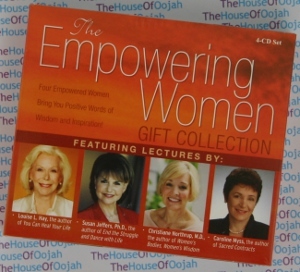 Filled with inspiration and knowledge for women of all ages, this four-CD set includes empowering lectures by these motivational women: Louise L. Hay is a metaphysical lecturer and teacher and the bestselling author of numerous books, including You Can Heal Your Life and Empowering Women. Louise offers penetrating insights on how women of all ages and backgrounds can experience self-love, self-worth, self-esteem, and a powerful place in society. Carolyn Myss, Ph.D., is a pioneer in the field of energy medicine and human consciousness. Since 1982 she has worked as a medical intuitive: one who \"sees\" illnesses in a patient's body by intuitive means. She will help you to break free of patterns that limit your ability to create a healthy body and a healthy life. She is the author of Entering the Castle. Louse L. Hay: RECENTLY DUBBED "the closest thing to a living saint" by the Australian media, Louise L. Hay is also known as one of the founders of the self-help movement. Her first book, Heal Your Body, was published in 1976, long before it was fashionable to discuss the connection between the mind and body. Revised and expanded in 1988, this best-selling book introduced Louise's concepts to people in 33 different countries and has been translated into 25 languages throughout the world. Louise Hay now heads Hay House, a successful publishing company. What began as a small venture in the living room of her home has turned into a prosperous corporation that has sold more than ten million books and tapes since its inception. Hay House authors include many notables in the self-help movement, including Wayne Dyer, Joan Borysenko, and Doreen Virtue, among others. In addition, The Hay Foundation and the Louise L. Hay Charitable Fund are two non-profit organizations established by Louise that support many diverse organizations, including those dealing with AIDS, battered women, and other challenged individuals in our society. Louise’s Hay healing message has been the subject of many newspapers and magazine articles.Louise Hay has appeared on television around the world, and her monthly column, “Dear Louise,” appears in more than 50 publications in the United States, Canada, Australia, Spain, and Argentina.